Ph.D. Geography or Doctor of Philosphy in Geography is a Doctorate Geography course. Geography is the study of the physical features of the earth and its atmosphere, and of human activity as it affects and is affected by these. The eligibility criteria for Ph.D in Geography is master's degree or equivalent in any disciplines with at least 55% marks in the aggregate (50% in case of SC/ST applicants). Such postgraduates are hired in capacities such as Content Editor – Geography, Geo Digital Strategist, Teacher & Lecturer - Geography and Biology, Assistant Professor – Geography, Specialist - Geo Engineering Solutions, Geo Web Metrics Specialist, Subject Matter Expert – Geography etc. The average tuition fee charged for the course in India ranges between INR 2,000 and 5 Lacs, a doctorate employed in research institutes and govt. sectors get salary of Rs 8,000- Rs 15,000 per year depending upon their specialty and experience. In private organizations the remuneration is better with benefits likewise as medical allowances, house rent, etc. Geographers as a teacher may get an amount of INR 10,000 - 25,000 every month. Admission Process based on entrance test and direct interviews of the short-listed candidates. Top Recruiting Areas Businesses, Community, Social & Personal Service, Diplomacy, Publishing Houses, Geography Departments, Health & Social Work, Divinity, Hotels & Restaurants, Insurance Industry, Public Service, Research, Public Administration, Retail Sector Student Affairs, Teaching etc. Job Positions Archivist, Charities Administrator, Human Resources Specialist, Consultant, Diplomat, Ethics Advisor, Higher Education Teaching & Research, Clergy Person, Human Resources Officer, Insurance Underwriter, Social Worker, Information Management/Science, Survey Interviewer Teacher, Tutor & Lecturer etc. Ph.D. in Geography: What is it about? Geography is the study of the Earth - the land, topography, attributes, people and phenomena. Students usually under this degree prepare a thesis on any of these topics such as Environment and Ecology, Fundamentals of Remote Sensing and GIS, Contemporary Human Geography, Advanced Physical Geography, Political Geography, Agricultural Geography, Social Geography of India, Natural Resource Management, Urban Settlement System, Cultural Geography, Regional Development, Hydrology and Water Resource Management etc. Candidates willing to know about nature and scope of cultural geography, environment and culture, scaling techniques, rank score, weighted score, and types of regions and methods of regional delineation are good suit for the course. Applicants must have problem-solving skills like extracting relevant information, drawing conclusions and making logical recommendations. They should be good communicator as they have to present findings and explaining complex data, producing written technical and non-technical documents. Other required skills are analytical skills such as analyzing research methods, data, conclusions and recommendations. The qualification criteria for seeking after a graduate degree are holding a bachelor degree in respective subjects. The term for this course is 3 years. The application procedures will be different for different Universities. There will be online mode and offline mode of application in most of the Universities. Applicants can contact the official address of the University, which they wish to study the course for procuring PhD entrance exam form along with prospectus. After correctly filling the forms, applicants have to send it to the University official address prior to the last date. They must also attach pertinent credentials mentioned in the brochure along with the forms. The selection of the hopefuls will be based on the performance in the Admission Selection Process. Ph.D. in Geography gives numerous career opportunities to the hopefuls who are expressively interested in learning a lot of different features of the planet. Geographers are put in various associations in the part of demographers, farming authorities, urban and provincial organizers and remote sensing specialist, and so forth. They can also work in research and government sectors. Geographers can also seek placement in research agencies such as environmental issues, population studies and rural development. Teaching profession can be undertaken in universities, colleges and schools for those who are geographers. Post- graduate students can also start their own coaching institutes. 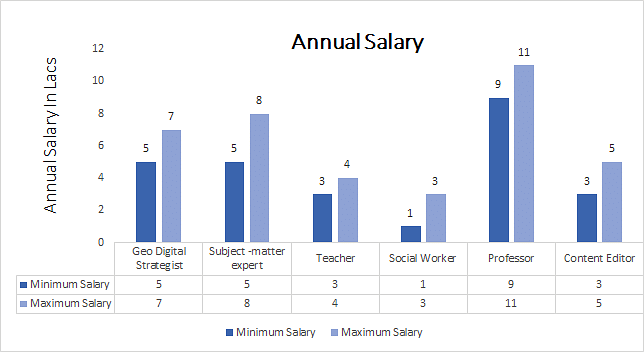 Some of the popular professional avenues open to successful graduates/ postgraduates of the course are listed below with the corresponding salaries offered for the respective positions.